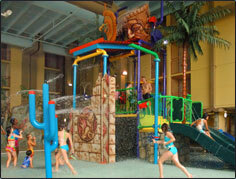 Chicago's first indoor waterpark features 24,000 square feet of covered activities. Beyond the body and tube slides, a lazy river glides gently around the park. Water basketball, a swirl pool, and a vortex pool are also there for the refreshing. The park also includes a zero-entry play area for kids -- and kids at heart -- with a dumping bucket. The Island Breeze Bar and Grill is there for light food and drinks. You can book this Holiday Inn property -- in the Chicago suburb of Elmhurt -- online. Just check the following link to check online discounts and make your reservation directly with Holiday Inn. Online deals for overnight stays at Mayan Adventure? Just click here.